Xanthomendoza hasseana (Räsänen) Søchting, Karenfelt & S.Y. Kondr. Thallus: foliose, forming small to medium-sized rosettes up to 3 cm wide or extensive colonies, loosely adnate, lobate lobes: dorsiventral, flattened to convex, 0.3-0.9 mm wide; tips: rotund to pointed, 0.1-0.4 mm wide upper surface: yellow to light orange, smooth to shiny, not sorediate medulla: white, reticulate, with short hyphae lower surface: white, smooth to somewhat wrinkled, with abundant long, white to yellow rhizines Apothecia: common, laminal, stipitate, up to 3.5 mm in diam. ; margin: smooth with more or less abundant cilia; disc: orange; epihymenium: brown, c. 10 µm thick hymenium: hyaline below, 70-90 µm tall;paraphyses: simple or branched, cylindrical, septate asci: clavate, 8-spored; hypothecium: hyaline to pale brown, 25-75 µm thick ascospores: ellipsoid, polarilocular, hyaline, 14-20 x 6-10 µm; septum: 4-10 µm wide Pycnidia: common, immersed to protruding, darker than upper surface conidia: bacilliform, 3-4.2 x 1-1.5 µm Spot tests: upper surface K+ purple, C-, KC-, P- Secondary metabolites: parietin (major), fallacinal (major), emodin, teloschistin (major) and parietinic acid. Habitat and ecology: on bark, occasionally on rock or detritus, in rather humid microclimates World distribution: boreal and temperate regions of the Americas, and Asia(?) Sonoran distribution: coastal regions of southern California. Notes: Xanthomendoza hasseana is similar to X. montana, but X. hasseana has slightly longer and narrower lobes that are usually lighter orange pigmented, smaller and more distinctly ellipsoid spores with a wider septum. In X. hasseana the rhizines as well as the cilia on the thalline margin of the apothecia are usually longer. The distribution areas of the two species seem not to overlap, because X. montana is only reported from higher elevations inland. 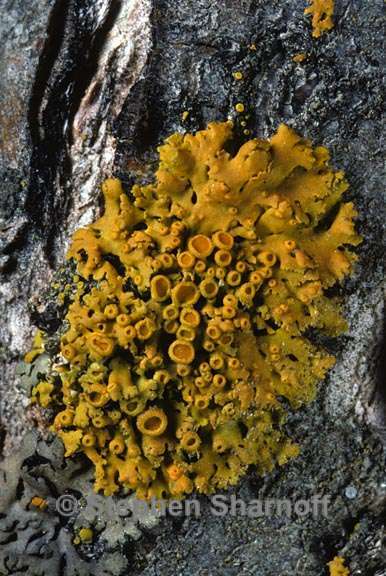 Xanthoria polycarpa has more convex and narrow lobes and usually the apothecia cover a greater part of the thallus. Important characters are the conidia, which are ellipsoid and produced in rather inconspicuous pycnidia in Xanthoria polycarpa; whereas they are bacilliform and produced in more conspicuous pycnidia in X. hasseana.